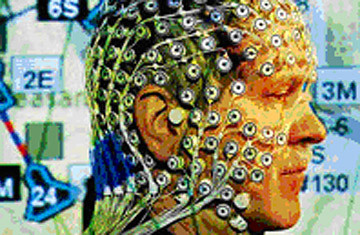 Army scientists want to cram this array of brain-wave reading sensors into a helmet. B-movie buffs may recall that Clint Eastwood used similar "brain-computer interface" technology in 1982's Firefox, named for the Soviet fighter plane whose weapons were controlled by the pilot's thoughts. (Clint was sent to steal the plane, natch.) Yet it's not as far-fetched as you might think: video gamers are eagerly awaiting a crude commercial version of brain wave technology  a $299 headset from San Francisco-based Emotiv Systems  in summer 2009. The key challenge will be to develop software able to pinpoint the speech-related brain waves picked up by the 128-sensor array that ultimately will be buried inside a helmet. Those sensors detect the minute electrical charges generated by nerve pathways in the brain when thinking occurs. The sensors will generate an electroencephalogram  a confusing pile of squiggles on a computer screen  that scientists will study to find those vital to communicating. "We think we can train a computer to understand those squiggles to the point that they can read off the commands that your brain is issuing to your mouth and lips," Schmeisser says. Unfortunately, it's not a matter of finding the single right squiggle. "There's no golden neuron that's talking," he says. Both scientists pre-emptively deny expected charges that they're literally messing with soldiers' minds. "A lot of people interpret wires coming out of the head as some sort of mind reading," D'Zmura sighs. "But there's no way you can get there from here," Schmeisser insists. "Not only do you have to be willing, but since your brain is unique, you have to train the system to read your mind  so it's impossible to do it against someone's will and without their active and sustained cooperation." And don't overlook potential civilian benefits. "How often have you been annoyed by people screaming into their cell phones?" Schmeisser asks. "What if instead of their Bluetooth earpiece it was a Bluetooth headpiece and their mouth is shut and there's blessed silence all around you?" Sounds like one of those rare slices of the U.S. military budget even pacifists might support.